The name Epirus means 'mainland'. Epirus is a rugged and mountainous region. It borders West Macedonia and Thessaly to the east, Sterea Ellada (Central Greece) to the south, the Ionian Sea and the Ionian Islands to the west and Albania to the north. The province has an area of about 92200 km² (3.551 square miles). It is part of the wider historical region of Epirus, which overlaps modern Albania and Greece but mostly lies in Greek territory. About 350.000 people live in Epirus. 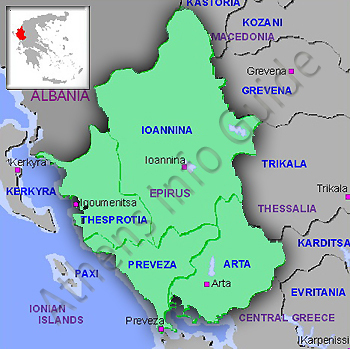 Nearly one third of them live in the Ioannina, the capital and largest city of Epirus.